While Pushbullet started out as a simple file-sending tool, it has blossomed into an all encompassing messenger that lets you respond to notifications from your desktop, send files and a whole bunch more. Now, it has another new feature that should make managing your different devices and accessing your files a doddle. 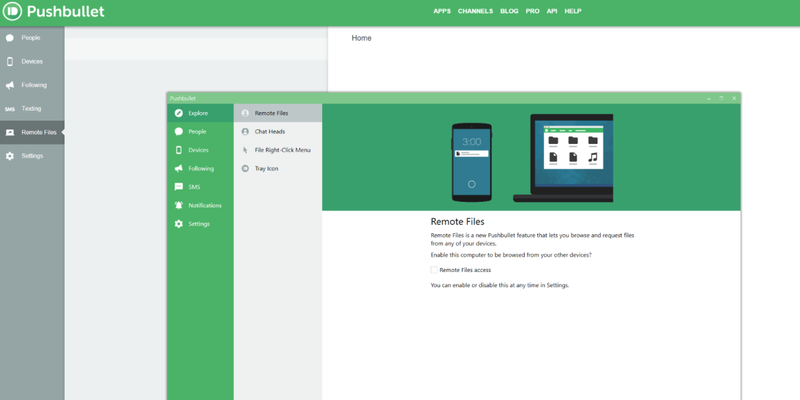 The new ‘Remote Files’ feature, which is disabled by default, lets you individually connect each of your devices and get access to any of the files stored on them. The files you want to access don’t even need to be in a special location, you can just browse them as normal wherever they are. Essentially what this means is that you can have a convenient remote access option for all of your devices that doesn’t rely on you being connected to the same network as them all or storing your data in the cloud for ubiquitous access. The device that you want to access will need to be switched on and online though, obviously. It’s no use unplugging your desktop or letting your laptop fall asleep and then still expecting access to all your stuff. In my briefing testing, the feature worked well – and quickly, which is a major problem for some remote access tools. Right now, the feature is only available to Android and Windows users, as it requires a native app to work. And the question you’ve all been asking is, do you need to be a paying user to access remote files? No, you don’t, but if you are paying, you’ll be able to perform an unlimited number of file requests each month, rather than the limited number free users get. For just this week, however, there’s no limit for free users, so go crazy.